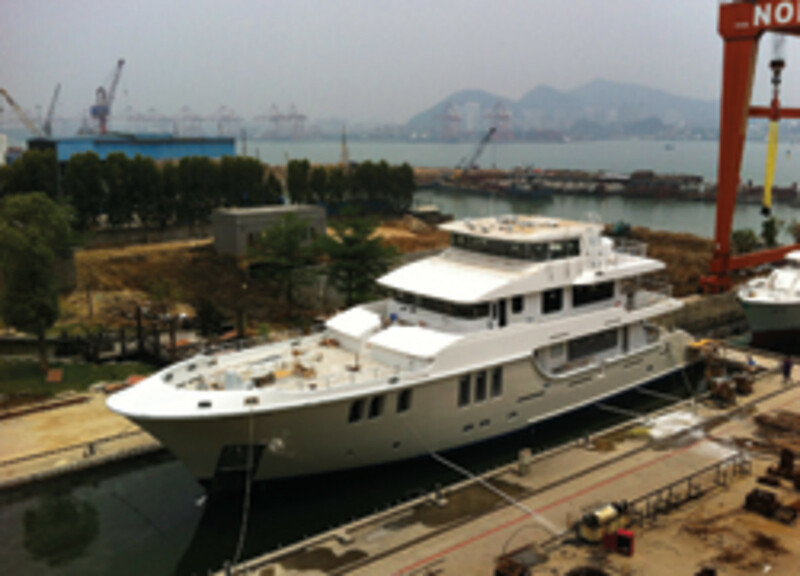 The Nordhavn 120 completed a crucial step when it was launched into the test tank at South Coast Marine in Xiamen, China, in late April — on track for delivery this summer to a customer in western Canada. The passagemaker was to remain in the tank for about a month as its systems are fired up and tested. When it is completed, N120 Hull No. 1 will undergo final ocean trials and ABS certification assessment in preparation for delivery — on her own bottom — to Vancouver, British Columbia. The builder attributed the decision to deliver the yacht that way to logistics, the sheer mass of the boat and economic factors. The current plan has the yacht leaving the factory July 1 with a delivery crew led by PAE vice president Jim Leishman. The nonstop passage from China to Vancouver is expected to take 24 to 28 days. Service companies reported that 64 percent of loan origination was signed with new banks or finance companies in the past six months, but that didn’t necessarily translate into more loans being granted, according to the NMBA study. Consumers seem unresponsive to the increased wealth they should be feeling with stock market indexes reaching new highs and housing values on the rise. Automobile sales continue to gain strength, and attractive financing and leasing offers are available, so buyers could be replacing their aging vehicles before making discretionary purchases. NMBA member lender respondents reported a steady tightening of credit criteria throughout 2012 that has carried over into this year. Twenty percent of the survey respondents indicate that credit criteria were more stringent in the first quarter than in the previous period. Waycross, Ga.-based Carolina Skiff LLC says that based on state new-boat registration data compiled by Statistical Surveys Inc. the company was the nation’s top fiberglass-boat builder in 2012. Statistical Surveys national marine sales manager Ryan Kloppe confirmed Carolina Skiff’s statement and said the registration data Statistical Surveys compiled for 2012 shows the company sold 2,950 new boats last year. Manns Harbor, N.C.-based Paul Mann Custom Boats is celebrating its 25th year of Carolina boat design and specialized running bottoms in its sportfishing yachts. The company says it builds boats today in the traditional frame-and-plank cold-molded style or through the use of jigs, or a combination of the two methods, according to customer wants and needs. Paul Mann’s 81-foot private yacht Georgia Girl was named one of Yachting magazine’s Best of 2011. It re-entered the U.S. market after a 10-year hiatus, but Sealine International’s future was unclear after the British-based luxury yacht builder entered “administration,” a status akin to receivership in the United States. “We are currently seeking a buyer for the company, either in its entirety or its individual assets,” Baker Tilly public relations manager Frank Shepherd said in early May. Sealine, based in Kidderminster, near Birmingham, was put into administration April 30. Sealine South Coast, the company’s sales and service division, which is based in Southampton, entered administration May 1 under Baker Tilly. On April 30, 234 of the company’s nearly 300 employees were immediately “made redundant,” or laid off. As of May 1, 50 staff members remained employed, Shepherd said. Susan Hardwick, of Hardwick PR, which handles press relations for Sealine, said the implications for the manufacturer’s North American market, which had been a bright spot, is unclear at this time. Grand Banks Yachts says it is on track to complete five luxury yachts for buyers from Singapore, Japan and Micronesia in the financial year that ends June 30. It marks the highest number of sales to the region since the 2008-09 global financial crisis, and comes amid growing interest in boating among Asians, according to BMY News. Singapore Exchange-listed Grand Banks told the publication three boats were delivered between July 2012 and March to buyers from Singapore and Japan. Two more should be finished by the end of June for Singaporean and Micronesian buyers. In its previous financial year Grand Banks sold three yachts in Asia. Grand Banks says Asian sales for the past year underscore the success of its new designs and growing acceptance among buyers from the region for yachts built at its yard in Johor, Malaysia. FLIR Systems president and CEO Earl Lewis was expected to retire May 19 and be replaced by Andrew Teich, who has been president of the company’s commercial systems division. FLIR said Lewis will assume a senior adviser role to assist the transition and will remain chairman of the board. FLIR is the parent company of Raymarine. “This is the culmination of a process that began more than two years ago with three of my direct reports completing the Harvard Advanced Management Program,” Lewis said in a statement. “I look forward to leading this outstanding management team and our global group of dedicated employees to the next level of growth,” Teich said in a statement. Fairport Harbor, Ohio-based Tartan Yachts will be supporting the 2014 Gay Games in Cleveland by building 20 boats for the sailing portion of the world’s largest LGBT multisport event. The Gay Games, held every four years since 1982, will take place for the ninth time Aug. 9-16, 2014, at venues around Cleveland and Akron, Ohio. More than 11,000 people from all over the world will participate in more than 35 sports and cultural events. The games are open to anyone 18 or older. Russo Marine said it has added Greenline Yachts to its three sales and service locations in Massachusetts and Rhode Island. “Since the first of the year we’ve been searching for product alternatives that will not compete or conflict with our Brunswick brands and we had no idea this boat existed until we saw it on the cover of Soundings Trade Only,” Russo Marine president and CEO Larry Russo said. The Slovenian company began to focus on selling its diesel-electric hybrids in the United States this year, appearing on the cover of the March issue of Trade Only. Russo says the innovation drew him to the model the moment he saw it. Russo Marine was scheduled to receive its first Greenline in May. Greenline Yachts are produced in Slovenia and Italy by The Seaway Group, which also builds Shipman Carbon Sailing Yachts and Skagen Motor Yachts. Greenline’s 40 Hybrid received an Active Interest Media Editor’s Choice Award last fall at the Fort Lauderdale International Boat Show. It has also received honors that include International Boat of the Year and environmental and design awards. The National Marine Manufacturers Association released a study showing that Canada’s core recreational boating industry contributed an estimated economic impact of $5 billion (about $4.9 billion in U.S. dollars) and 67,000 jobs throughout Canada in 2012. The release of the NMMA study coincided with the second annual Recreational Boating Day on the Hill in Ottawa May 1. Members of NMMA Canada from all sectors gathered on Parliament Hill to advocate on behalf of the approximately 4,400 Canadian recreational marine companies. The Day on the Hill allows the industry to communicate with parliamentarians on issues affecting recreational boating and communicate the value of the industry. Hickling, Arthurs, Low conducted the study on behalf of NMMA Canada and in cooperation with Discover Boating Canada and regional marine trade associations. A memorial celebration is being planned for June 23 at 4 p.m., at the Port Annapolis Marina.